2 Additional Screws have now been included to securely keep the optional trim affixed onto the unit while in transit. TRU-VIEW-XL, BI-DEEP & BI-SLIM electric fireplaces are suitable for installation in outdoor areas protected from direct water impingement. 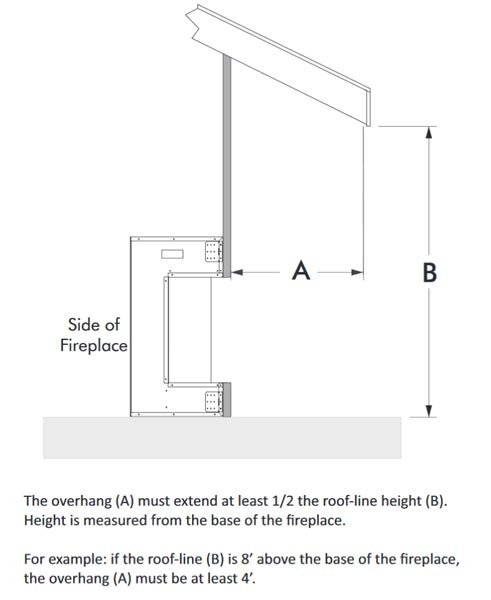 In addition to maintaining the listed mantel and combustibles clearances, a rain protection overhang factor of 1/2 shall be constructed to the front and to each side of the installed appliance. See illustration below. All wiring connections to line power shall be in accordance with local building code requirements. *Amantii recommends that the Panorama Series BI-DEEP and BI-SLIM model installations also adhere to these instructions in addition to using the protective PAN-COVER. The warranty has been updated for clarity, consumers are to contact their dealers directly when a warranty related issue occurs. It has also been made clear that Amantii/Sierra Flame Electric is a parts only warranty and that labor and service are not covered as part of it. Changes are effective immediately and will be in future printed and digital versions of the manual. Inventory levels will now be posted in the dealer login area of Amantii.com each week. Please note that the 2015 levels are not listed, but that we have ample inventory should you require those products. Effective immediately all warranty claims and parts requests must be detailed on the Parts Request form. This will help our team to ensure the correct part is sent in a timely fashion. Photos are not mandatory but can be very helpful. From time to time Amantii will request additional photos if required. WM-FM-59-7023-BG when it is in fact the WM-FM-60-7023-BG. This has been corrected on the digital version and all future print runs. There has been a price correction to a ‘typo’ on the March 1 price list. it is in fact the same price as the WM-FM-48-5823-EMBER at $1449.00. Amantii has revised it’s Order Policy, and introduced a new Returned Goods Policy. Please review the forms and speak to your representative if you have any questions. Only the DEEP models of the Panorama Series come with a log set. The tray in the SLIM 6 3/4″ model is too narrow to accommodate the logs. There is in circulation a number of 1st edition brochures that incorrectly state that a log set comes with the SLIM units. This has been corrected and future printed versions of the brochure are accurate. The correct information has always been found on the website as well as the price list. Amantii reserves the right to make changes to its products without notice. Rolling change effective immediately to the appearance of the BI-50-FLUSHMT Series. The newest generation of models will no longer have three slots in the front of the glass surround. The new design has one slot that is centered at the front bottom of the glass. The on / off switch is located to the left of the slot behind the front glass. More repair manuals have been added to the dealers area for Advanced Series Wall Mount / Built-ins and Panorama series models. At Amantii, we are constantly making improvements to our products in order to achieve the very best in appearance and quality. Most often these changes do not affect technical specifications, however we have made a change to our Panorama Series ‘SLIM’ models that we felt it necessary to advise you on. In order to generate a more robust flame appearance the depth of the unit was increased by 3/4″. The ‘Slim’ models are no longer 6″ in depth and are now 6 3/4″. The depths of all ‘Slim’ shipping cartons will also increase by 1″. These changes are reflected on all widths of Panorama ‘Slim’ models shipping AFTER July 15th only. Please be aware that we are out of inventory of the Advanced Series model WM-BI-76-8221-BLKGLS. We are retiring this model from our line so please remove it from your offerings and remove and sell your display model. We recommend that you suggest to consumers the Enhanced Series WM-BI-72-8123 in its place. We no longer use the mirror in the back of the unit and have gone to a darker non-reflective material. We have done this to change the look of the flame, and this gives the flame a much bolder appearance. The current stock we have on hand in our warehouses has the modification completed so we would appreciate your assistance with updating your showroom models so that customers are seeing an accurate flame. Please request the new part asap. When replacing the circuit board on a Panorama series model, the remote control also must be replaced. Please make sure when placing an order that you have taken the correct model and description from the most current price list. Vivedecor.net is not an authorized e-dealer for Amantii products. The pricing they are advertising is incorrect and does not conform with Amantii policies. Amantii products are not authorized to be sold below MSRP and for this reason Vivedecor.net can not purchase product to sell. Amantii strongly cautions consumers to not place an order with Vivedecor.net for Amantii products. Amantii Dealers are under no obligation to ‘match’ vivedecor.net’s pricing and are encouraged not to as it is in violation of Amantii’s policies.